Fresh Folio premium WordPress theme was Woo Themes’ second portfolio based theme ever created to help creatives promote their skills with a clean, sophisticated design. With a little influence from another great Woo Themes offering, Fresh News, Fresh Folio premium theme boasts 7 diverse styles to choose from. We are confident you will be “wooing” new clients in no time (it was too easy, we had to)! Make sure to check out the live demo of this great Woo Themes classic to get a better idea of what all it offers. Built in Flickr and Twitter widgets to show your thoughts and photos! 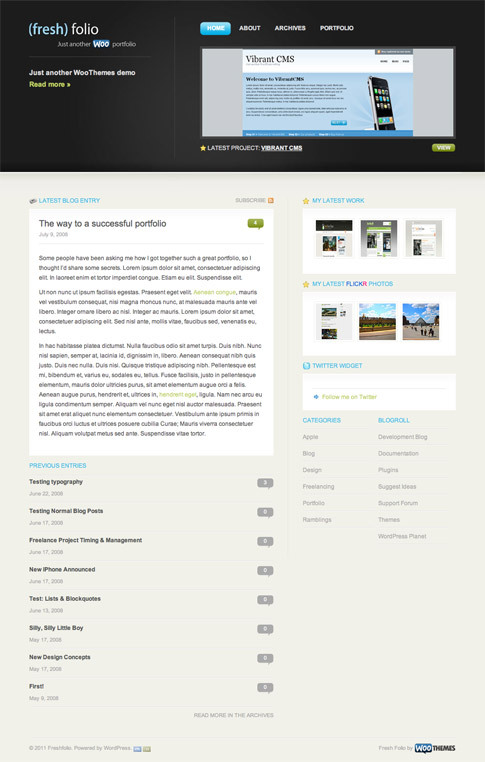 Come back and check out the showcase as we find more sites from around the web using Fresh Folio.